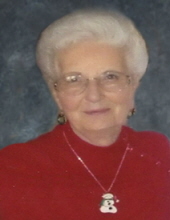 Hilda Jones Britt, 85, passed away on Friday evening at the SECU Hospice House in Smithfield. Hilda was born in Wayne County on October 23, 1933 to the late Herman Wesley Jones and Beulah Fields Jones. She was preceded in death by her husband of 63 years, William Otto Britt, Sr. Hilda retired from the Goldsboro News Argus after 41 years of service. She was a member of New Hope United Methodist Church and had been an active member of the ladies auxiliary with the Pinewood Fire Department. A service celebrating the life of Hilda will be held on Tuesday, November 6, 2018 at 11:00 a.m. in the chapel of Seymour Funeral Home with Rev. Steve Wellman officiating. Interment will follow in Wayne Memorial Park. Hilda is survived by her grandchildren, Melody Britt Swaim, Wesley Britt, Cody Britt, Lacy Allen Britt, Anastacia Sumner, and Amanda Singleton; and six great-grandchildren. She is also survived by her sister, Nina Watts of Burgaw; brother, Herman Nelson Jones of Florida; and several nieces and nephews she loved very much. In addition to her husband and parents, she was preceded in death by her sons, Lacy Sheryl Britt and William O. “Bill” Britt, Jr.
We would like to give a very special thank you to the wonderful staff at SECU Hospice House for the love and care they provided for Hilda during her final days. Simple words cannot express our gratitude. Also a thank you to the caregivers with Community Home Care and Hospice who cared for Hilda over these past few weeks. Flowers are welcome or memorials may be made to New Hope United Methodist Church, 200 E. New Hope Road, Goldsboro, NC 27534. The family will receive friends on Monday, November 5, 2018 from 6:00 – 8:00 p.m. at Seymour Funeral Home. To send flowers or a remembrance gift to the family of Hilda Jones Britt, please visit our Tribute Store. "Email Address" would like to share the life celebration of Hilda Jones Britt. Click on the "link" to go to share a favorite memory or leave a condolence message for the family.